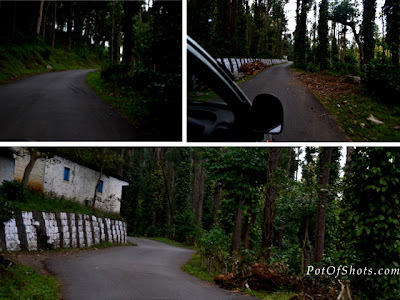 UPDATE: all Yercaud trip pics will be updated here. A perfect weekend getaway from Chennai. Best time to visit Yercaud is from March to May. Nav had already booked a resort, Heaven’s Ledge, in Yercaud Gowri Estate. The contact there told us to be there by 3:30 PM so as to not miss the beautiful sunset. Murali and his cousin (Navneeth) were to start at 9 AM, pick me up by 9:30. They picked Andy and me up by 11 AM and thus began one of the most memorable trips. Note: there is a CCD and other eateries at a HP petrol bunk, that comes on your left (your side of the road), 15 KMs after Vellore on NH48. Good place to stop and grab a bite without entering Vellore city. We stopped for tea around 3PM at Tirupattur Junction. It was short 10 mins break and Andy took over after that. Patch of bad roads for a couple of Kms after Tirupattur slowed us a bit, otherwise the roads were well maintained. Like I said Andy is fast and we reached Kuppanur by 4:45PM, thats where we take a diversion to Yercaud. Beautiful Ghat roads – Curvy, narrow and well-maitained. The narrow roads could be dangerous, so be careful. Take the curves slow and watch out for vehichles coming in the other direction, honk (not too much!). Navneeth really wanted to see that promised sunset and Andy was doing everything in his power to reach there on time. we reached Yercaud junction and had to go 15 kms further up. We reached Heaven’s ledge by 5:45 PM, thankfully the sun was still setting and we could get a glimpse of the beauty. awesome! As we drove in to the ledge, it IS literally a ledge. Edge of a cliff cleared for camping purpose. I’ve stayed in a lot of places but this has to be no.1 in the list. The scenic view was stunning. The person in-charge showed us the sunset and then showed as to the camp – a tent pitched in the ledge.Sunset lasted long as the hues changed showcasing various beautiful colors. It was lovely, comfortable and kept us safe from the wind. It was cold but the wind made it worse and since we were in cleared up area and on the ledge, the wind was stronger and it was really chilly. The VIDEO of the tent is here. The daylight was showing off its colors till 7, after which the solar lamp lit up. The guide started a campfire and we blissfully basked in its warmth. There was/is no network for Airtel or Vodafone – which is what we had, but the guide told us that Aircel and BSNL networks were available there. We had home-made dinner brought to us and it was yummy! We had asked for Veg food as our group was predominantly veg and it’s better to have veg food while traveling. We sat around talking and eating. The time went by and by the time we hit our beds it was midnight. Around that time the solar light finished its share of stored-up charge and went to sleep too. It was dark and we slept in our tents listening to the sound of wind in the trees and rustling of leaves. 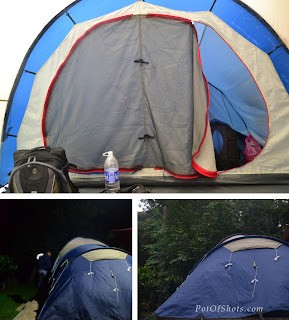 Sudden strong wind would shake the dew from the trees that would fall on our tents. In the morning it got real chilly which woke us up. We got out of the tent by 7:30 and went straight to the fire that was being used to boil water. FIRE – Thanks to the person who started it all! We washed up and we had a spicy home-made breakfast brought to us. We started the trek around 10 AM and trekked 5 Kms through the mountains. This was the highlight of the trip. The trails – there was hardly any! Our guide had a Aruval (larger form of a sickle) with him and cut the shrubs and branches as he went along. We trekked with branches brushing against us and through caves and under the rocks. He took us to various view points, some of them had a 4000ft fall. The sight, trek and the experience was beautiful. we came back to our place by 12:30 PM and had lunch at 1PM. During the Trek From Heaven’s Ledge. The plan was to leave this place after lunch and go to a hotel in the city, go around the city to various tourist sites and then leave for Chennai on Saturday afternoon. But somewhere during the course of lunch, one of us suggested that so far the experince has been awesome and we will be bored to death staying in a hotel and then going to “touristy” places. (Andy and I have come to Yercaud couple of years back and it didn’t have anything to offer. The tourist sites had very less to offer and we returned home after 3 hours of sight seeing.) 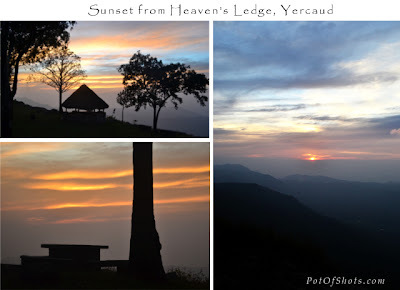 I seconded the idea that we should leave Yercaud by Friday evening and head to Chennai. Everyone agreed. We went to a private lake (small one, more of a well) for boating. We had to walk till the well and came across Orange trees which had yummy looking oranges and when we did pluck and eat, our eyes were not wrong. The oranges were delicious. If you really want to do boating in a big lake, go to Yercaud lake. We packed our bags and started to Chennai by 3PM. On our way back we stopped by the Yercaud junction. Who goes to a hill station in India and not have Chilly bajjis? no one! We too had some delicious bajjis and came our way to Chennai. On the way back we took a break for dinner at CCD and reached Chennai by 10:30PM. 1. December is not usually the time for trips to Yercaud, as people find the weather too cold for comfort. Because of that we had less crowd in the campsite. I do not know how crowded it will be if you go during summer time. 2. We went on a week day – Thursday. Another reason for less crowd. 3. We took the tents and not cottages (which are also present on the estate) and that saved us from the crowd. You can read all the tweets sent during the trip here. Bus journeys – helpful tips!